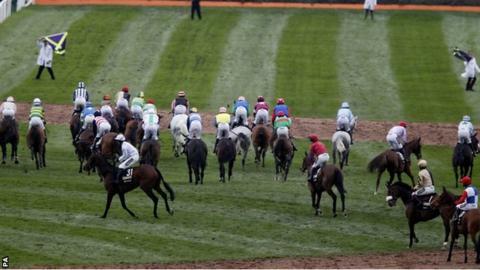 The false start at the Grand National was the result of an "archaic" system that is "not fit for purpose", says former champion jockey Peter Scudamore. The 39 jockeys who started the race, won by Pineau De Re, refused to attend a stewards' inquiry. The riders had learned they each faced two-day riding bans for breaching rules by forming a line before the official start time. "We're in 2014 and have not got a system that works," said Scudamore. "It's depressing. I don't blame the starters, the starters' assistants or the jockeys. We have an archaic system that is not fit for purpose." Scudamore's son Tom piloted The Package to 12th place in the big race. But on the first attempt to start the National, assistant starter Simon McNeill was knocked over by one of the runners as it approached the start line. He was not badly hurt. An initial inquiry took place after the race, with most of the riders who took part in attendance, and 18-time champion jockey AP McCoy acting as their spokesman. But when the hearing was reconvened following the day's final race, all of the jockeys refused to take part. Peter Scudamore, an eight-time champion jockey, added on BBC Radio 5 live's Sportsweek programme: "There was confusion and the jockeys felt slightly aggrieved the inquiry was not held straight after the race. "They did attend the first inquiry but were sent out because they did not have enough time to conclude it." Scudamore said several of the jockeys had to leave Aintree to catch flights to their next racing engagements. He added: "They were told that some could go because they had two-day suspensions anyway. The jockeys thought that, since it had been decided to ban them and their arguments had not been listened to, what was the point of going back in?" The British Horseracing Authority (BHA) said the inquiry has been adjourned to be held at its headquarters in London on a date that is yet to be announced. BHA spokesman Robin Mounsey said: "This process will allow all involved the opportunity to review the chain of events and consider all relevant factors, hopefully in a more constructive environment. "The hearing will consider the start and what prompted the initial inquiry and also the events which unfolded during and after the stewards' inquiry." Of the 40 jockeys in the National, only Brendan Powell - rider of Battle Group - was not involved in the dispute, because his horse planted itself and would not approach the start.